MRI findings are more common in selected patients with acute low back pain than controls? The purpose of this study is to investigate if lumbar disc pathology identified on MRI scans is more common in patients with acute, likely discogenic, low back pain than matched controls. We compared rates of MRI findings between 30 cases with low back pain and 30 pain-free controls. 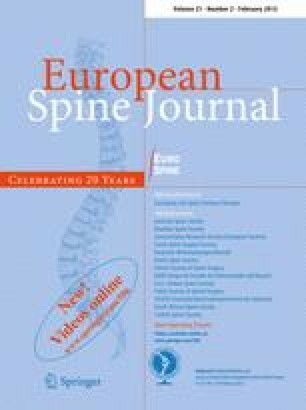 Cases were patients presenting for care with likely discogenic low back pain (demonstrated centralisation with repeated movement testing), of moderate intensity and with minimal past history of back pain. Controls were matched for age, gender and past history of back pain. Cases and controls underwent MRI scanning which was read for the presence of a range of MRI findings by two blinded assessors. The presence of disc degeneration, modic changes and disc herniation significantly altered the odds of a participant being a case or control. For example subjects were 5.2 times more likely to be a case than a control when disc degeneration grade of ≥3 was present, and 6.0 times more likely with modic changes. The presence of a high-intensity zone or annular tear was found to significantly alter odds for one assessor but not the other assessor. MRI findings including disc degeneration, modic changes and herniation are more common in selected people with current acute (likely discogenic) low back pain than in controls without current low back pain. Further investigation of the value of MRI findings as prognostic factors and as treatment effect modifiers is required to assess the potential clinical importance of these findings. This work was supported by Faculty of Health Sciences Grant, The University of Sydney.